For comfortable mounting of a radiator on top of an enclosure without havong to machine a large opening into the enclosure, spacers are the way to go. Only 4 holes with a diameter of 4mm need to be drilled to allow the included M3 screws to be pushed through. 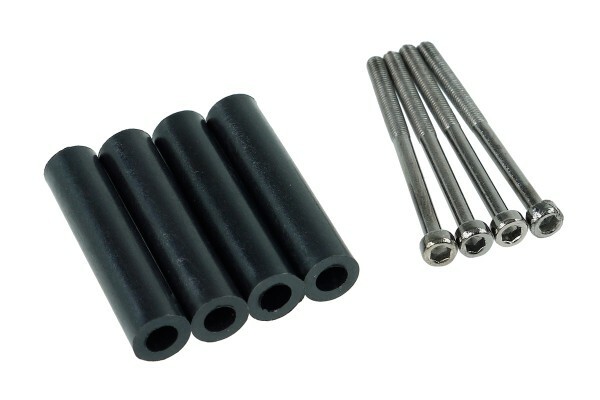 Black spacer sleeves create an elegant smooth appearance, ensuring a spacing of approx. 34mm between radiator and enclosure, allowing ideal airflow through the radiator. All NexXxoS, Magicool, Airplex, Xspc(some models), Swiftech, Innovatek as well as all other radiators with M3 mounting / fan threads. Please note: This is the new version with spacers made from black plastic instead of transparent Plexiglas. An inner diameter of 4mm even allows use with M4 screws! Eigenen sich die Abstandhalter auch für den Phyobya Nova 1080 um diesen am Gehäuse zu montieren? Klar, die können Sie dafür verwenden.